This afternoon over 50 local helpers ventured out into the freezing winter's day for a get together at the Robin Hood pub so that I could say thank you for all their hard work over the past 12 months. It was great to see so many people, some of whom came despite suffering this dreadful flu that has been going around. I had several new people turn up who have only got involved in the last few months and it was great to be able to welcome and introduce them to the team. The activists are the life blood of the Conservative Party and indeed are vital to my campaign to win Chatham & Aylesford at the next Election and so I couldn't thank them enough for what they do essentially for me and the Party. 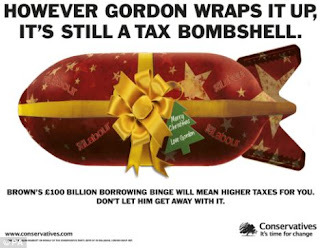 If you would like to help then please contact Chatham & Aylesford Conservatives at caconservatives@btconnect.com for further information. This month's Total Politics magazine features an article I wrote about my "hinterland", a term used by Dennis Healey's wife to describe the interests a politician has to keep themselves happy. The article describes how my coaching gives me some valuable down time and can be read in full HERE. The magazine is available in all good newsagents and features loads of excellent articles including an interview with Harriet Harman, deputy leader of the Labour Party; what's in store for us in 2009; and key facts about the Czech Presidency of the EU. It also includes this fab picture of me looking like a seal!! 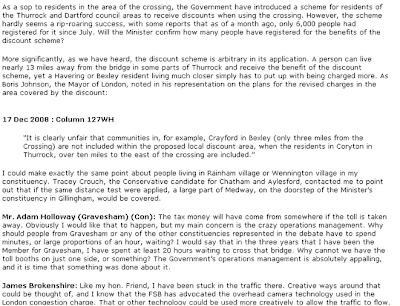 Yesterday, the Hornchurch MP James Brokenshire held a debate in the House of Commons on the Dartford Crossing charges, during which he mentioned my campaign to scrap the stealth tax to cross the Thames. This is a huge step forward in my campaign to represent the concerns of residents in Chatham & Aylesford at Westminster. I'd like to thank James Brokenshire for raising this important part of the debate. There is a very interesting article in today's Sun on whether there could be a February General Election. Gosh I hope so! OK I admit it - I was one of the 8 million people who voted in the X Factor final last night! And who did I vote for? Well half of Meridian Girls FC won't like it because one of the girl's best friends is the cousin of one of the boys from JLS (tenuous I know but they are teenage girls!) but I voted for Alexandra! Yesterday I made house calls to people who have been in touch regarding problems that they need help with. This is by far one of the most rewarding parts of the job and was reiterated to me by one long serving MP recently who said in 21 years he still enjoys doing casework and the minute that stops then he'll call it a day. But as rewarding as it might be it is also still quite upsetting and one visit I made yesterday highlighted how desperate people are by the time they get to ask for help. A problem I dealt with yesterday regarded disability living allowance which essentially involves a gentleman losing his allowance despite having never received written communication that this was going to happen - the first he knew about it was when the charity which provides him with a car called to tell him they were coming to collect it. Ironically his claim was originally reviewed because he started doing some light part time work - something the Government actively encourages. It is quite clear from the fact that he can barely walk that he has a case but all he wanted from me was to help him write a letter because he was worried he wouldn't do it properly. It took me no time at all to help him but if his appeal is successful then it will bring him a huge amount of mobility support that will enable him to continue to work and play an active role in his family. Fingers crossed. Leading political blogger Iain Dale was on the Politics Show South East today talking about the poor use of the Internet by politicians. When you look at how Obama used the Internet in his election campaign you can see why he, and many others, would say that. There are huge opportunities for e-campaigning which are currently not being harnessed but Iain gave this blog a big thumbs up during his interview. He did however call me Tracey Chatham before quickly correcting himself! It was very funny. You can watch the interview HERE - the relevant section is about 25 minutes in. I used to be a bit of a Grinch when it came to Christmas - well not Christmas itself but the long (and getting longer) run up. But today, I went to my first Christmas bash - a mulled wine and mince pie fundraising event - and thoroughly enjoyed myself. Not least because the homemade mince pies were absolutely delicious and although I didn't drink any mulled wine because I was driving over to Whitstable for my Mum's birthday, it smelt heavenly. I wish I had the time to make mince pies but since I don't I scoffed down quite a few before leaving so I have probably had my seasonal fix anyway! So now I am over my Grinch phase, when is my next Christmas event...? One of the best things about being a candidate is you get to learn about issues you didn't even realise you knew nothing about! Tonight I have been at Woodies Youth Centre observing the Medway Autism Group and Information Centre (Magic), as part of the TreeHouse "Walk in our Shoes" campaign. Before tonight I am ashamed to say I knew hardly anything about autism - and a quick straw poll in my office before I left showed that I was not alone. But over 2 hours this evening I learned an incredible amount about the condition and left Woodies far more aware of the challenges and needs not only of the children I met and saw this evening, but also those of their parents. Magic's support centre is as much for the mums and dads as it is for the children and it was really interesting to listen to them, and hear how they learnt about autism and the roller coaster of emotions they went through as a consequence. What is very clear is that there a very few state supported services which help parents in these circumstances which yet again demonstrates the value of the third sector. In Medway there are nearly 1000 known cases of autism out of a national total of 90,000. The importance of special education is obvious but as always the cost to local government is an issue. However what I discovered this evening is that many of the changes that authorities, Government, and even society needs to make are relatively cost-free. So for example, teacher training on how to deal with autistic children is extremely poor - in fact I was told that only half a day is dedicated to all disabilities. It is quite clear from speaking to parents that this is not anywhere near enough. Spending time at centres like Magic would help increase the knowledge base of even the most experienced teacher. Another aspect is awareness. As I said at the outset I was ashamed with how little I knew about autism - but tonight I found I wanted to learn so much. Others will remain totally ignorant about a condition that affects the communication, social understanding and behaviour of 1 in every 100 school aged children. If you knew what you were looking for, you would recognise autistic behaviour in supermarkets, playgrounds, shopping centres etc every day of the week but instead you, like me, probably think what you see is a child being naughty or disruptive, cast some sort of aspersion about the parent's lack of control before moving on. Increased awareness can happen through programmes like Walk in our Shoes but longer term awareness is also about inclusion. I have often thought that inclusion should happen at a very early age. Rhys, my eldest nephew, was at a nursery school in Hythe with a child who had Downs Syndrome. As a consequence of his everyday attendance and inclusion at nursery, Rhys, now ten, has absolutely no issue with disabled people. Unlike many children his age, if he sees someone with Downs Syndrome or another obvious external disability, he doesn't stare and ask awkward questions. Why not? Because he doesn't see anything "different" - as far as he is concerned, or certainly when it comes to Downs Syndrome, he understands that sometimes things happen but it is not something that is necessarily frightening or harmful so why should he be afraid or treat them in any other way. If children are introduced to autism at an early age then why would they be frightened of it? Why would their only view of autism be like mine, and those of the parents I spoke to tonight before their children were diagnosed - that autism means aggressive behaviour and rocking back and forth? Well it wouldn't - because children at a young age become conditioned and if something is considered "normal" by those around them, then it becomes normal to them too. But this is in the long term and in the meantime one of the volunteers was talking about the need for reverse inclusion - i.e children from mainstream education going to special education centres and doing things like mentoring, buddying, or simply playing or learning. And funnily enough what I saw tonight at the Youth Club was 30 odd children running around playing games in the same way that if I went tomorrow to the Youth Club I would see 30 odd children running around playing games. So I went through my own reverse inclusion process tonight - I don't really know what I expected this evening, only what I saw and heard wasn't it - it was much better. Much of what could be done to transform the lives of children with autism is cost free but the benefit it would bring in the long term would be invaluable. I learned a lot about autism tonight, and yet I believe I only scratched at the surface and I am looking forward to learning a great deal more in the future. I promised earlier on in the week that I would post more about the general public's reaction to Pre-Budget Report, but in a way it almost feels unnecessary. There has been so much negative comment in the papers that it hardly seems worth reporting that almost everyone I have spoken to thinks it was all spin and no substance. Those that work in shops were telling me that people are walking into their shops, looking around and then walking back out again - this reminds me of a report I saw on the BBC news of lots of people in a shopping centre but hardly anyone carrying bags. If people are worried about their jobs - which they genuinely are - then it is hardly a surprise that they are not making frivolous purchases. 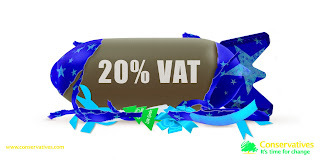 The temporary VAT cut appears not to have fooled people into thinking they have more money in their pockets and most now know that it could go up as a high as 20%. I am not sure I have met one person who thinks they are going to be better off in the long term because everyone knows that with all the debt building up we are going to have to pay it off somehow and sometime soon. And if the sceptical reaction to the PBR wasn't enough, the arrest of my former boss Damian Green has caused total consternation - especially amongst those I was talking to in Snodland this afternoon. Damian received and revealed information that 5000 illegal immigrants were working in the UK...and promptly got arrested for it. Everyone I spoke to think that he was doing this country a service, not committing a crime and the running joke now is to say "ssh, they are listening..." every time someone talks about Damian. It is ridiculous but sadly not untypical of the Big Brother Government we currently have. The sooner the election is called, the better. 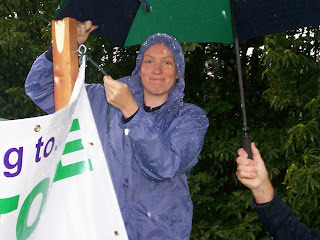 The team took a break from campaigning today which given the poor weather was probably a very good thing. So instead of knocking on doors I went down to Lenham Primary School to help my sister, who is on the PTA, set up the "messy room" and spoil my two nephews and niece whilst mummy wasn't looking. And it was great!!! At one stage, and thankfully there is no photographic proof, I had 3 little ones painting my nails all different colours on a glitter covered table. I was trying not to enjoy myself but it is incredibly hard being a grouchy Crouchy when you are being asked to help make a peg angel with wet, badly varnished fingernails by some small child with a painted face, jumping up and down with the excitement of being able to use glue and glitter with impunity. Anyway after having more fun than I let on, I headed off to Snodland to watch the Christmas lights get turned on. Despite the cold and drizzle, half the town turned out to watch the Mayor of Tonbridge & Malling arrive on Santa's sleigh. Unfortunately in the process of getting to the sleigh the Mayoress slipped over and hurt herself. Thankfully the paramedics arrived quickly and were able to patch her up so that she could continue with the ceremonial duties. I managed to get a couple of shots of Santa before he headed back to Lapland - he was at Lenham Primary School too so he has clearly had a very busy day! With so much early Christmas cheer it is no wonder I can't get Rudolph the Red Nose Reindeer out of my head..."then one foggy Christmas Eve, Santa came to say..."
I was very sad today to hear the news that Andrew Rowe, the former MP for parts of Chatham, passed away on Friday. I had the pleasure of meeting Andrew who served as the MP for Mid-Kent from 1983 to 1997. 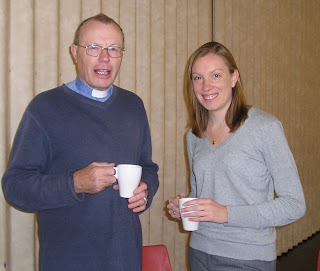 He had a keen interest in the voluntary sector and was a keen campaigner on both local and national issues. More on what local people have said to me about the Chancellor's statement later this week. So far, it has not been good! Put it this way...they have not been fooled. Last night I attended the annual Snodland Quiz which this year took place at the Methodist Church. I both love and loathe quizzes - which basically means I love it when I get the answers right but hate it when I don't! Thankfully I was on a good team and my lack of knowledge about musicals or stars from the screen was more than made up for by my colleagues. We ended up coming a respectable 5th but the winning team were the same lot as last year...and the year before that (mental note - join their team next year!). Last night local Conservatives met for their annual dinner with this year's guest speaker Nicholas Soames, MP for Mid-Sussex and of course Sir Winston Churchill's grandson. We had a very enjoyable evening at the excellent Kits Coty restaurant, nestled into Blue Bell Hill with wonderful views over Aylesford and beyond, where we heard a fabulous speech from Nicholas which ranged from the current economic crisis to the wonderful work of the armed forces. I am delighted he came to visit not least because he was affectionately reminiscing about his childhood cricket lessons just down the road at Mote Park - it felt like he was enjoying being back in glorious Kent! I have just watched the most amazing programme on BBC4 called Walter's War. It is about a young black man born in Folkestone who after playing for Tottenham Hotspur (during which, as my Spurs encyclopedia tells me, he scored 2 goals in 10 first class games) went on to become the first commissioned black officer in the Army to lead British troops in World War I. He died in the second battle of the Somme. I am ashamed that as someone who was educated in Folkestone and previously took a real interest in the history of the area, and of course as a committed Spurs fan with numerous books on the club, I had never heard of Walter Tull. I hope that someone with influence in Folkestone was watching and maybe generations to come will be less ignorant about Walter Tull and what he achieved. If you missed it you can watch it on BBC iplayer HERE. As I previously reported on this blog I helped the Poppy Appeal earlier this week and today I, along with hundreds of other local people, wore their poppy with pride in remembrance of those who lost their lives in World War I. I went to two very different services - one in Aylesford church this morning and one at the Royal British Legion Village this afternoon. Both were packed and far busier than last year which I think is down to it being so hard now, with so many young men and women fighting in Iraq and Afghanistan, not to think about those who have more recently lost their lives - something that the Poppy Appeal now reflects in its assistance programmes. I was talking to a lady whose son was stationed "somewhere in Afghanistan" who wanted to celebrate his service by remembering those who had died on duty. She found it comforting to be with people who understood what the call of duty meant and I found her courage and focus incredibly inspiring and I wish her well. And as I sang the national anthem and watched the lowering of the union jack by a young army cadet I felt incredibly proud to be British and silently I thanked all those who had died to keep our country free. We shall never forget. This afternoon, alongside local Councillors John Balcombe and Dave Smith, I joined volunteers outside Aylesford Sainsbury's to help sell poppies before next week's Remembrance Day. The Poppy Appeal is a hugely important campaign and each year the nation expresses it support for the work of the Royal British Legion through the appeal. Millions of poppies are sold every year and the poppy itself has become such an important symbol of reflection, remembrance and of course hope. Getting involved today made me really appreciate the support our armed forces of past and present have from ordinary members of the public - people were not just putting notes into the bucket but were commenting on what it meant to them. 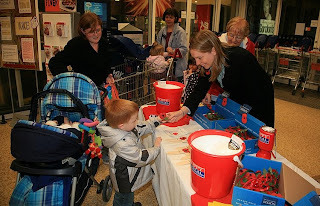 And what I found even more touching was how many children were coming up and putting money into the bucket in return for a poppy - and knowing what it meant: it was nice to hear a young child nagging their parents for a poppy rather than sweets! 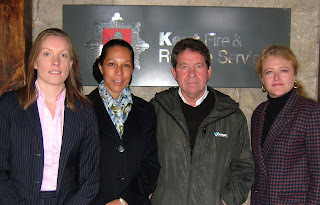 It was always nice to be supporting such an important national charity which has a huge local presence. With the Royal British Legion Village and Royal British Legion Industries being based across the road from the Sainsbury's, it genuinely felt like I was doing more for the cause today than just turning up at a service on Sunday. The Royal British Legion provides financial, emotional and social support to 10.5 million people in the UK and because of the continued underfunding from the Government the Poppy Appeal provides a significant proportion of the funds. I hope that my two hours selling poppies helped raise a little more for the vital service that the Royal British Legion continues to provide. Before heading of to the meeting in Aylesford I was extremely disappointed to learn that the owners of Buckmore Park, Avondale South East Ltd, have gone into administration. The sports complex cost over £15m when it was first built and has had several million pounds of lottery funding in order to help it open but was forced to close in 2003. It is such a shame because the site is fantastic and with over 230 acres and with close links to the M2 and M20 could easily have been used for the London Olympics. However it has thus far been overlooked and now its future is in doubt. Thankfully both the Scouts and the Kart Track have existing leases which enable them to continue to operate. My worry is that the site will be sold to housing developers and yet again another of our last remaining green spaces will be fast-tracked into helping deliver the extra 3 million homes this Government wants to build. I sincerely hope that this is not the case and that a buyer can be found who is willing to use the site as a means of providing sporting facilities for local residents. This evening I attended a public meeting in Aylesford regarding the upgrading of noise barriers between Junctions 4 and 5 on the M20. Previously the Highways Agency were intending to progress with works with very little consultation with local residents and were proposing to remove much of the vegetation between the motorway and the barriers. This has now been dropped thanks to the hard work and persistence of local councillors Dave Smith and John Balcombe, as well as the huge protest from residents. Now it appears that only a few trees will be felled although some will be subject to coppicing. Depending on how quickly the proposals are agreed work could begin in the next few weeks, otherwise with Christmas looming the work will be postponed until January. Further work on the planned improvements can be found HERE. New season. New kit. New shirt sponsor. And a 3-1 victory! The under-11s kicked off the season by coming 1 nil down to win. Leah scored a hatrick and pocketed £10 in the process from one of the dads!! Well done girls. A few months ago I went to the dedication of Luton Memorial Meadow and a moving occasion it was too. Today, in advance of the Mayor's visit on Thursday, I went to see Don Philips who, along with a few other veterans has single handed made the memorial meadow what it is. We spent some time together this morning looking through his photo album which rather brilliantly tells the story of its evolution from a field into a beautifully landscaped place to commemorate fallen soldiers from the Luton area. 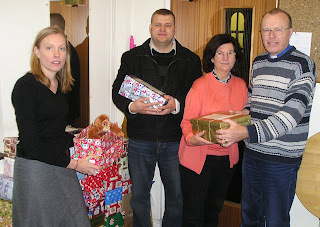 Not only has there been a lot of physical help but a number of kind donations from local Lordswood and Luton councillors, as well as private businesses. There is genuine concern locally that the memorial meadow may become a victim of the obsession by central government to build houses on almost any remaining green space in the South East, but hopefully with common sense from Medway council and the huge support of local people (as well as the meadow's most famous supporter, Dame Vera Lynn) any kind of threat to the future of the memorial would be quickly seen off. I would like to see this kind of area protected so that future generations will be able to pay their respects to those who lost their lives in the name of freedom. Congratulations to Burham for winning Kent Village of the Year. Thanks to the hard work of the Parish Council and local residents, Burham now goes through to the national final of the competition! I am writing to you as the Minister with responsibility for the Highways Agency. On 1st September, the Highways Agency will begin work on the noise barrier between Junctions 4 and 5 of the M20 – which bypasses the historic village of Aylesford in Kent. Whilst long term improvements on the barriers are welcome, and local residents have suffered from noise and air pollution for some time, there are severe concerns about the measures which, given the timetable for, require your urgent attention. The programme of work begins with the removal of trees that have been in place between the Motorway and the housing estates for over 30 years. The trees cover a bank stretching nearly half a mile along the M20 and are around 8 to 9 meters tall. Their height not only helps absorb sound but also a black dust residue resulting from the sheer volume of UK and continental Europe traffic using one of the busiest stretches of motorway in the UK. The proposed new barrier will be 4 meters in height and the closest point is only 2 meters from residential properties. Furthermore there will be no replanting of trees. 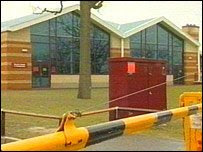 Despite this major change to the noise barriers which will affect over five hundred local residents as well as potential further noise disruption to the local secondary and primary school following previous improvement works, no consultation has been held about their removal with local residents or the local authority. Local councillors were only made aware of the proposed work a few days ago and only a handful of affected residents have received any communication from the Highways Agency. It is extraordinary that local residents have been denied the opportunity to consider and comment on the proposals, which demonstrates the arrogance and incompetence of this Government Agency under your command. Please could you contact the Highways Agency, as a matter of urgency, and request that they put the work on hold until they have fully consulted with local residents about their proposals. Let's hope some common sense emerges soon! UPDATE: The work has now been postponed until further consultation with local residents - common sense at last. Saving Capstone Valley - 12 months later! 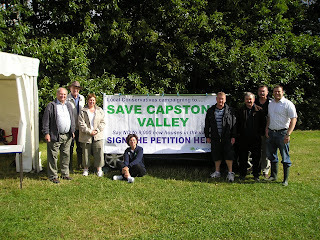 Once again, local Conservatives organised a stall at the annual Kites over Capstone weekend to raise awareness of the application to build 9,000 houses in the valley and to collect signatures on our petition to save the valley for future generations. Nearly 15,000 residents have now signed the petition and the determination to save one of Medway's remaining open spaces is as strong as ever. This year, however, the sun shone and over 1,000 additional names were added to the petition. My thanks go to local councillors David Wildey (who co-ordinated the weekend's campaign) along with Alan Jarrett, Pat Gulvin, David Brake, Matt Bright, Adrian Gulvin and Denise Wildey who assisted on the stall. This weekend I have one of my oldest school friends Chloe, and her new husband Martin, are staying with me whilst they are on holiday from New Zealand. Chloe emigrated about 8 years ago and this is her first trip back to the UK for sometime. So how better to reintroduce her to English life than by taking her to the Aylesford village festival to watch Morris and belly dancing, eat a hamburger prepared by the local scouts, and hook a duck from a swimming pool to win a bow and arrow. Thankfully, and unlike last year, the weather was glorious so an amble stroll around the festival, looking at the Kent produce for sale wasn't too much like hard work for my visitors from the southern hemisphere! After Aylesford we headed up to Lordswood for the Community Fete at the Kestrel Avenue shopping centre, which was smaller but well attended. When I left the local youth worker Andy was painting a huge mural with some youngsters from the estate to hang on the outside of the youth club - it was looking good and can't wait to see it up. As the offical national day of Fetes draws to a close, I am now back indoors giving my friends the attention they deserve - especially as they are on their honeymoon...! This year marks the 60th birthday of that great British institution, the NHS. To celebrate this milestone, and to show support for the doctors, nurses and other NHS workers who play such an important part in all our lives, the Conservative Party has created an online birthday card for you to sign. We have all benefited from the NHS’s care at some point, so please join me in wishing many happy returns to everyone involved with this vital institution. My apologies for blogging silence. After spending Saturday in Wayfield, and then Saturday evening at the presentation night with my under 1o girls football team, I headed off to Wales early Sunday morning for a 90th birthday party and only got back yesterday afternoon in time for the launch of the new political lifestyle magazine Total Politics. The magazine is published by Kent blogger Iain Dale and will be available from most major newsagents. Alternatively, the new Total Politics website can be found HERE. Sadly as a result of being at the family party I was unable to attend the launch of "Let's go Karting" at Buckmore Park, hosted by Formula 1 legend John Surtees, where youngster aged between 8 and 16 will be able to get behind the wheel for £5 in an attempt to find the next Lewis Hamilton or Jensen Button. I wish the scheme every success and hope that it attracts many local kart enthusiasts to test their skills. Have just got back from a busy day out and about which started off in Lordswood this morning to help deliver my latest newspaper followed by a meeting with residents in Luton over car parking issues. Then this afternoon, I headed over to Blue Bell Hill for their summer fete which this year was on a Wild West theme. Unfortunately, as the vicar explained, their PR operation hadn't really kicked in so the only people who knew it was Wild West were the Committee! Still the huge cowboy straddling the entrance to the church, surveying the village green, looked fabulous. No village fete would be complete without a local dance troupe and thankfully the sun was out so the morris dancers and the modern dancers entertained villagers for most of the afternoon with some wonderful performances. I bought some locally produced apple juice and honey and wandered around in the sun with Blue Bell Hill Councillor Peter Homewood happy that the village festival season is finally here - summer has arrived!! Tonight I drove down to Folkestone to celebrate Michael Howard's 25 years as an MP. I grew up with Michael as my MP and he should be credited for getting me actively involved in politics. I spent many happy years involved in his association and working in and on his election campaigns so I enjoyed returning to Folkestone this evening to see so many familiar faces and old friends. I think it is testament to Michael's achievements that there were video recordings from all 5 Leaders of the Party he has served as an MP under - Mrs Thatcher, John Major, William Hague, Iain Duncan Smith and of course David Cameron, who like me has worked for Michael and knows him well. I felt privileged to be invited to his surprise party but sad that Parliament, along with the electorate of Folkestone & Hythe, is losing such a hard working MP. Is the Lisbon Treaty dead? After the Irish voted "no" in their referendum on the Lisbon Treaty, one would be forgiven for celebrating this evening thinking that the EU Constitution was dead. Except I just heard an interview with a French politician on the World Tonight which makes me wonder whether the Irish vote will simply be ignored and the Treaty, in some other form, will just be pushed through. UK Foreign Secretary David Miliband has already said that the Labour Government will push ahead with ratification, despite not asking the public what they think in a referendum as promised in their manifesto. The EU rules clearly state that the Treaty has to be ratified by all 27 countries, but I get this sense that after the result today the goal posts have just been moved. Put the champagne on ice...this is not over yet. After spending the morning delivering newspapers, I joined Blue Bell Hill Councillors Allan and Peter in a community litter pick organised by the vicar of St Albans Church The Rev Phil Wootton. A number of parishioners and local residents turned up and were kitted out by Bev from Tonbridge & Malling Council in high visibility jackets and gloves, and after photos and a short prayer of thanks, off we went around the village armed with litter pickers and green bags. We were only out for an hour but still managed to fill half a dozen bags which is quite shocking. The funniest moment of the afternoon was when two bare torsoed lads in a suped up car pulled over and asked very politely (even saying please!) if they could put their beer can in the bin - the driver was at pains to point out that it wasn't his - before speeding off into the distance giggling to themselves. I didn't care - at least I didn't have to go and pick it up of the path with my litter pickers, which incidentally had a crocodile painted on them!! And after an hour of hard work in the hot sun I think it is now time for a long cool drink. This afternoon I joined the local vicar, councillors and residents for a short service to commemorate 60 years of the Luton Memorial Meadow, which has been recently redesigned and landscaped by volunteers to honour those from Luton who lost their lives during World War II. Flag bearers from the Brownies and Scouts stood alongside the local Royal British Legion and veterans for the prayer of remembrance and a minutes silence. Once the service was finished the summer fete was opened. I was shown the book of remembrance by Don, the veteran volunteer who, alongside Bob, has worked tirelessly to ensure that the memorial meadow is free from housing development and that the meadow is maintained to honour fallen soldiers. He proudly showed me photos and letters that span over 60 years, including two from Dame Vera Lynn. I was really pleased to have been a part of today's service. Following David Cameron's decision to hold his Shadow Cabinet in Maidstone, I hosted my first senior politician tour of the patch today. It was a bit odd to be on the "other side" of a tour as previously I had been the one that would sign off David Davis' visits, but today I was the one playing hostess - and I was unusually nervous when I woke up this morning. A lot of work goes into organising them and you are always at the mercy of other people so you can never be quite sure how a visit will go - but it went brilliantly. Michael Gove, Shadow Secretary of State for Children, Schools and Families, had specifically requested to come to Chatham & Aylesford which is hugely flattering because it usually happens the other way round! So after lunch at County Hall with Cameron and his team, Michael and I headed first to Aylesford Primary School where we were met by the wonderful headmistress Mrs Evans, the family liaison officer Jane and local Councillor Dave Smith. Mrs Evans took us on a tour of the school which is a delightful primary in the shadow of the new Sports Academy. It is sad that such a huge amount of money has been invested in the secondary school and yet the primary school has had very little extra money invested in it and although extremely neat and tidy is in desperate need of repair. So much time and energy is spent devising policy on secondary education that often the primary system is forgotten despite the fact that if you get it wrong in the early years, then the rest of the education system falters. As soon as you walk into Aylesford Primary, you know you are entering somewhere special - it was evident almost immediately, as we walked through a salsa class, that the children appeared to be thoroughly enjoying their learning. I was hugely impressed by the game of Simon Says being conducted in French by the Deputy Head - I am ashamed to say that I found it difficult to keep up with the children, who were a 100 times better than me! After our tour of the school, I took Michael up to Buckmore Park Kart Circuit where we saw the Park's launch of Playing for Success with local children. Playing for Success Kent provides a wide range of activities that enable, enrich and extend young people’s experiences in Kent. It promotes informal, active and most importantly learning opportunities outside normal school hours. Playing for Success is a partnership initiative between the Department for Children, Schools and Families, Kent County Council and four clubs in Kent including Buckmore Park, Ebbsfleet United and Kent Spitfires. Not only did we spend some time on the karts (although not driving them!) and in the class with the children, but we also heard about some of the other community projects Buckmore Park has been involved in to help local children, especially those who have been excluded from school. What this latest project helps do is highlight in a very practical way how literacy and numeracy fit into everyday life, and helps develop their skills in a way that is perhaps less daunting for them than a class room. It was hugely impressive and the children were very excited to be part of the scheme. Although the funniest part of the afternoon was when Michael started to ask questions about Britain's Got Talent - he wanted Signature to win (as did I) although almost everyone in the class had a different favourite!! Once we had finished at the Park I managed to get Michael back to Maidstone in time for his train back to London and finally heaved a sigh of relief - my first Shadow Cabinet visit had gone well, without a hitch and to schedule.